Some of the most frequent questions we are asked relate to the care of Iris plants.We thought it might be helpful to give a month by month account of care needed and which Irises are in flower. Winter flowering Iris lazica and ungulicularis are both in flower. Bulbs will be starting to show signs of growth in pots and may need watering. 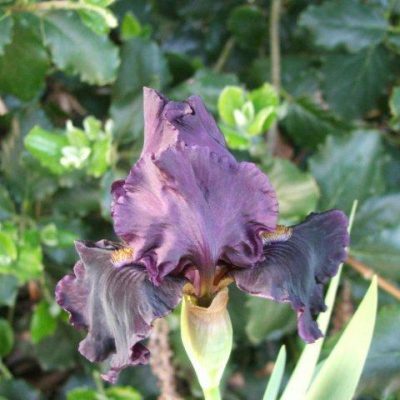 Protect early flowering Irises in garden if necessary. 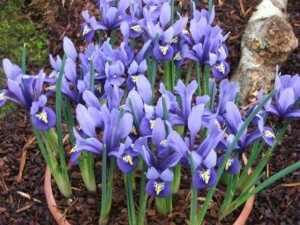 Generally Iris reticulata bulbs need little care in garden and should be in full flower throughout the month. To see beautiful displays of spring bulbs I try to visit the RHS Show at Westminster this month,snowdrops and Iris are in abundance. Bearded Iris Carefully remove any brown or damaged leaves .Check for signs of rhizome rot. Rhizome rot can be treated by cutting out affected area to a clean surface and cleaning cut surface with a very dilute solution of bleach and water. Slug pellets may be necessary. Apply a general purpose fertiliser. 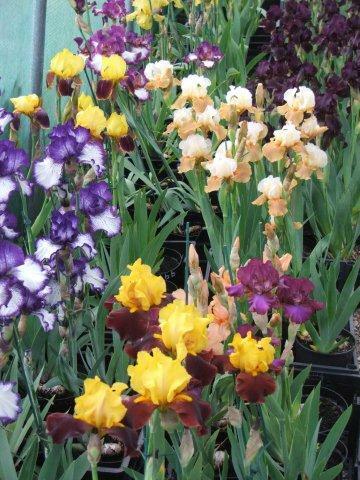 Winter flowering ,bulbs and some very early flowering miniature bearded Iris will be in flower this month. Short bearded Iris are at their best this month either in pots or in the garden.There are some wonderful colours available now. Dead head flowers to keep plants looking good. 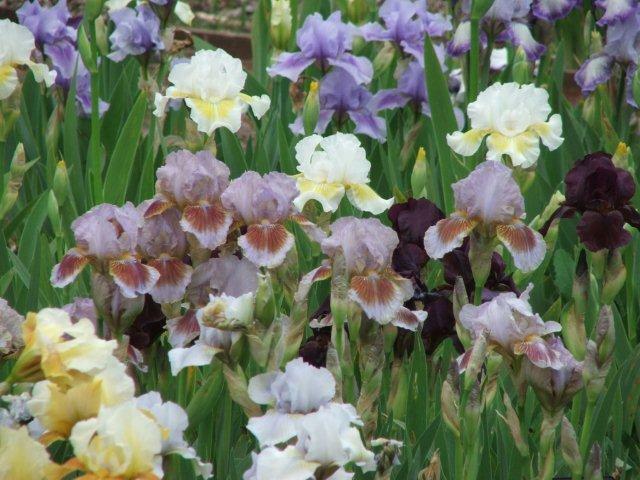 Siberian and Spuria Irises should be starting into growth and given a light feed with general purpose fertiliser. 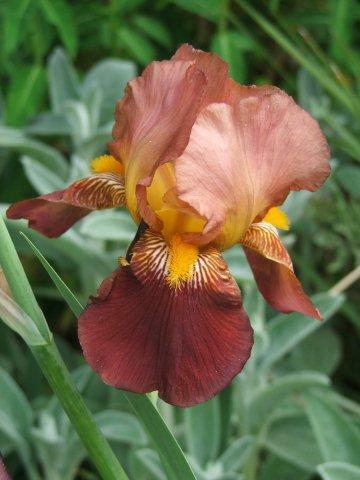 Intermediate Irises are flowering throughout this month with Tall bearded Iris following on.Dead head flowers as needed. Leaf spot virus can be a problem especially in wet weather.This is characterised by brown marks on leaves. Spraying with a fungicide can help .Remove affected leaves if possible. 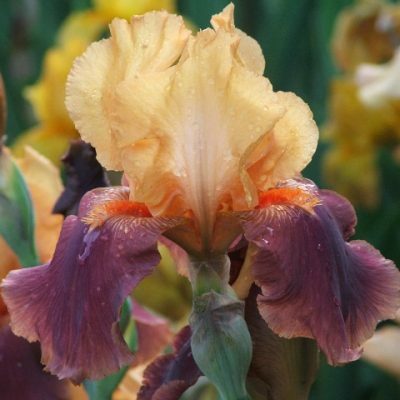 Look out for Iris displays at Chelsea Flower Show and try to visit Goodnestone House, Wingham Kent with a wonderful border of intermediate bearded iris and cream teas!!!!! Tall bearded Iris are at their peak this month. Stake plants if in an exposed windy site.Siberian Iris should also be coming into flower.Continue deadheading and cut back spent flowering stems to 2-3 inches. Once flowering has finished feed with a sulphate of potash fertiliser to help plants flower next year. Moisure loving Iris ensata is flowering throughout this month. Water well when plants are in flower. Ensatas are hungry plants and will benefit from additional feeding. Overcrowded Short bearded Iris can be divided and repotted or replanted. Order bearded Iris for next year. Iris ensata can be seen at Wakehurst Place East Sussex in their Iris dell. Bearded Iris can be lifted and divided this month. Discard the old rhizomes at centre of plant and replant outer healthy rhizomes. Trim back leaves of newly replanted Iris to prevent plants roots being damaged by wind. Ensure rhizomes are planted on surface of soil to allow sun to reach the rhizomes. Reblooming Iris eg Flirting Again should be in flower along with I.spuria. Complete planting of any bare rooted Iris. Some remontant Tall bearded Iris will be reflowering . Complete weeding and general tidy up of any Iris beds ready for winter. 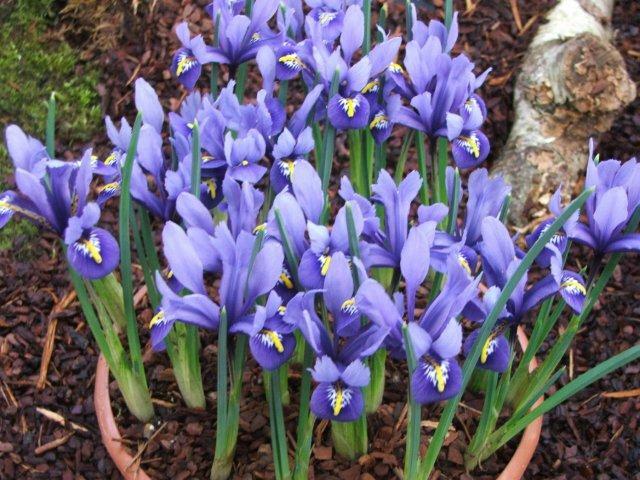 Pot up some reticulata bulbs for early flowering. Start watching for flowers appearing on winter flowering plants and some remontant Iris will continue to flower until frosts arrive. A month to rest and look forward to Christmas.